Whether the inspiration is to make a contemporary hit of an American classic or to translate a foreign smash into a domestic success, remakes always have the shadows of their progenitors looming over them. Even high-profile directors like Steven Spielberg can stumble when trying to recreate the magic somebody else originated; his Always failed to add much to A Guy Named Joe. Nonetheless, 16 years after that disappointment, Spielberg remade The War of the Worlds to much greater critical and commercial success. Then there are the vanity projects, such as Gus Van Sant’s fairly inexplicable, almost frame-for-frame (but in color) remake of Alfred Hitchcock’s Psycho. But then again, Hitch himself also tried his hand at remakes by retooling his own The Man Who Knew Too Much. What will Peter Jackson get wrong? Following on the heels of a summer that saw revivals of The Longest Yard and The Bad News Bears, the more serious fall schedule has its own plundering to do. What makes the original a classic? The amazing craft of Willis O’Brien. 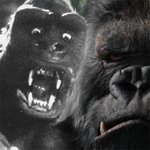 The mark of his hands lives forever as the ripples on Kong’s fur. Even beyond the stop-motion animation, the optical special effects are still amazing, 75 years later. All this is in service to a wonderful story that has inspired filmmaking nerds for decades. What could a remake possibly have to offer? The easy answer is “better” special effects, if you prefer the cold hard look of digital compositing to the human touch. But the real answer is “director Peter Jackson.” Fresh off his career-defining Lord of the Rings trilogy, he has both everything and nothing to prove. He may need to prove that there’s life after Gollum, and yet he can also rest on his laurels and only choose projects that genuinely inspire him. Let’s hope the combination strikes a happy balance. Also on the bright side, nobody named De Laurentiis was involved in this production and no real 25-foot apes were harmed during the making of the film. What will the remake probably get wrong? Even in Peter Jackson’s hands, there’s still the possibility that special effects will trump the story. What makes the original a classic? The musical numbers that were so peppy and on-target that even their horrific lyrics couldn’t drag them down. How about the perfect-fit personalities of Zero Mostel and Gene Wilder as Bialystock and Bloom? Then there was the perfect comedic form, with an ending both “tragic” and funny. What could a remake possibly have to offer? For one, it’s based on the Broadway stage version, and not the movie. Is a remake of a remake more independent? Will it be less likely to disappoint? Director Susan Stroman, and stars Nathan Lane and Matthew Broderick are hoping so. What will the remake probably get wrong? Feeling like a filmed stage show. It’ll have to take on a life and logic of its own, as Chicago did, in order to connect with the film-going crowd. As the skillfully-crafted movie version of Andrew Lloyd Webber’s The Phantom of the Opera proved, a boffo Broadway box office does not guarantee a line at the cinema. It all depends on how nimble director Stroman is at dancing from the Great White Way to the silver screen. What makes the original a classic? Greer Garson and Laurence Olivier play Elizabeth and Mr. Darcy, and Edna May Oliver is perfect as Lady Catherine. It’s a straightforward, faithful adaptation of Austen’s novel, unlike the recent Bollywood charmer, Bride & Prejudice. What could a remake possibly have to offer? A tough question. With Jane Austen movies a dime a dozen in the 1990s, it’s hard to imagine anyone daring audiences to sit through two more hours of proto-feminist romance. And yet, reviews from Europe say that this version, while still straighforward and faithful to the book, is still worth seeing. So perhaps audiences can make room for one more. What will the remake probably get wrong? Nothing. It can’t afford to. One false step and Austen-infatuated audiences would turn away. What makes the original a classic? It’s a celebrated drama, winning 1949’s Best Picture Oscar, based on an equally celebrated, Pulitzer prize-winning novel. What could a remake possibly have to offer? Timeliness. The story’s focus on the abuse of power is relevant in today’s political climate and the recent rash of scandals. Also, director Steven Zaillian has a solid resume that includes his screenplay for Schindler’s List, and Sean Penn should make a great Willie Stark. What will the remake probably get wrong? Finger-pointing. The greatest risk would be alienating either the Ultra-Liberals or Ultra-Conservatives. But, even so, controversy can be golden and, given the pedigree of the cast and crew, if they play their cards right, both affiliations will use the movie as an argument against the other. What makes the original a classic? Two words: Peter Sellers. What could a remake possibly have to offer? A different comedian’s take on some classic material? Roberto Benigni tried it with Son of the Pink Panther and it didn’t work. And earlier Alan Arkin attempted the role in Inspector Clouseau (1968) with disastrous results. It certainly doesn’t offer a new story: at one point entitled The Birth of the Pink Panther, this supposed “prequel” mines familiar turf: The legendary buffoon Inspector Jacques Clouseau investigates a murder and diamond theft. What will the remake probably get wrong? For starters, the age of a younger Clouseau. Steve Martin is already 22 years older than Sellers was while making the first Pink Panther. At the peak of his stand-up career, Martin might have been able to pull this off, particularly with his “naive American” schtick that worked so well. But his comedy star is waning (even if his art and playwriting stock is soaring), and the brutal physical comedy of the original movies would seem to be out of his range now. What makes the original a classic? Director John Carpenter, known for horror and action films with a brain. What could a remake possibly have to offer? Carpenter’s version was a good idea that had some basic problems that kept it from scaring audiences like Halloween did. A remake could potentially improve on Carpenter’s tale. What will the remake probably get wrong? Video director Rupert Wainwright directed Patricia Arquette in a horror film called Stigmata, which, at best was a guilty pleasure for critics. If John Carpenter wasn’t smart enough to get this movie right, it’s hard to imagine Wainwright doing any better. What makes the original a classic? Well, “classic” may be too strong a word, but the original was one of the blockbusters of its day, cashing in on the Airport disaster movie craze and opening the floodgates for other Irwin Allen “classics” such as The Towering Inferno and The Swarm. What could a remake possibly have to offer? Better special effects. Peterson has loads of experience making movies about boats (Das Boot) and big movies featuring big action set pieces. What will the remake probably get wrong? Peterson has adopted American action movie formulas too wholeheartedly (see Troy for an example). Hopefully this one will go back to Peterson’s roots and focus on everyday characters facing genuine conflict instead of action-movie villains who want to take over the world. In spite of the watery setting, be wary that this might be an Air Force One instead of a Das Boot. What makes the original a classic? Henry Fonda and Lucille Ball (in her second-to-last movie), for starters. Two single parents, he with ten kids, she with eight, cram 20 people into a house. No doubt the inspiration for The Brady Bunch and Eight is Enough, it gets Leondard Maltin’s seal of approval as a “wholesome ‘family’ picture” while still being well-written. What could a remake possibly have to offer? How about a less naive, more modern take on family life? With Dennis Quaid and Rene Russo it could go that direction. And director Raja Gosnell’s Never Been Kissed with Drew Barrymore found just the right amount of sweetness. What will the remake probably get wrong? Judging by director Gosnell’s critical flops Home Alone 3, Big Mama’s House, and Scooby-Doo, we may not be able to hope for more than cheap laughs and easy sentimentality. What makes the original a classic? It’s something of a 1977 time capsule. George Segal and Jane Fonda play it for laughs as they find themselves $70,000 in debt after Segal’s character suddenly — and without warning — loses his job. They begin robbing drug stores to maintain their comfortable lifestyle. What could a remake possibly have to offer? A contemporary spin. With people filing for bankruptcy at a record rate as the national laws change, this is another remake that can play off the “timeliness” factor, hopefully for laughs. With the movie being released Christmas week, Carrey and Leoni could make this tale of a married couple up to their eyeballs in debt a happy holiday hoot. Also, the opportunities for a biting social commentary, perhaps sugar-coated, are most certainly there. What will the remake probably get wrong? Jim Carrey. If it follows in the footsteps of Bewitched, which turned into just another generic Will Ferrell movie, then this one will be just another madcap Jim Carrey movie. Also, look for a turn-off if they go for gross-out laughs instead of aspiring to something a bit smarter and situational.